Entry rugs are a smart and necessary part of entrance areas for schools, hospitals, gyms, offices, stores, and other facilities that have high amounts of foot traffic. A high quality, water and debris catching rug can help keep buildings clean and safe. We feature two highly rated commercial entry rugs in this article. They are the Spectra-Rib Olefin Carpet Mat and the Spectra Soaker Polypropylene Carpet Mat, both designed by leading rug manufacturer, Musson Rubber Company. The predominant feature of the Spectra-Rib Olefin Carpet Mat is how well it collects debris in its ribbed texture. The Spectra Soaker Polypropylene Carpet Mat has excellent water collection capabilities with its raised rubber edge. Both rugs are rated for debris and water collection, as well as other features including sunlight fade resistance and stain resistance. They are perfect for high traffic areas. Spectra-Rib Mats feature defined ribs that scrape and hold dirt and moisture. This rug is highly rated for the following: water absorption, soil retention, sunlight fade resistance, and stain resistance. These ultra-ribbed rugs will help your facility stay cleaner longer by catching the salt, dirt, and grime brought in on shoe soles. It will also deter the formation of hazardous puddles by catching water and snow. This commercial entry rug is easily cleaned with a vacuum, hose, or broom. 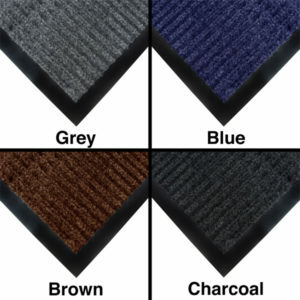 Spectra-Rib Olefin Carpet Mats are available in the following colors: grey, blue, brown, and charcoal. * If you need a different size, give us a call us to learn about the alternative sizes we can order. Spectra Soaker mats help facilities stay dry, safe, and clean. 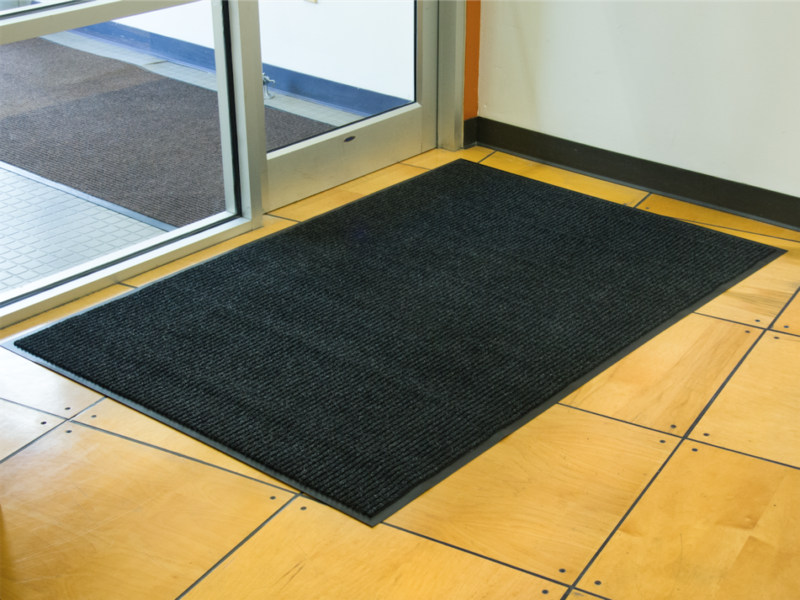 These commercial entry mats are specifically designed to retain moisture. This entry mat features a raised rubber edge, which holds the water it collects instead of letting it flow onto the surrounding floor. It can be used both inside and outside due to its polypropylene (polymer plastic) fiber construction and rubber back. The raised grid pattern helps to remove dirt, ice, snow, water, and salt from shoes. 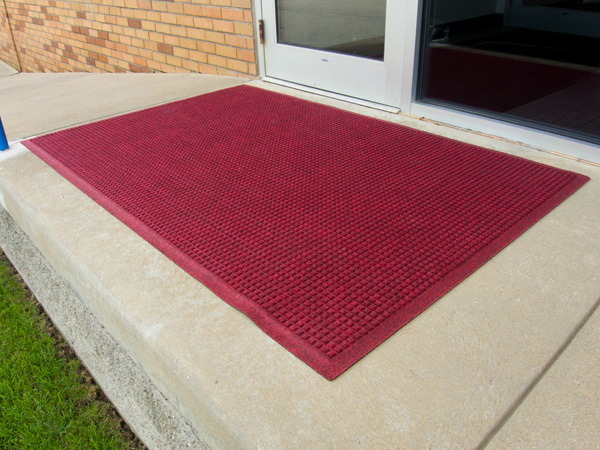 Water retaining and dirt collecting entryway carpet mats are a prudent addition to the entrance areas of stores, schools, hospitals, gyms, offices, and other facilities that have high amounts of traffic through the building. They become most useful during winter and rainy seasons when customers, patrons, students, and/or employees are tracking in snow, water, mud, salt, and debris. 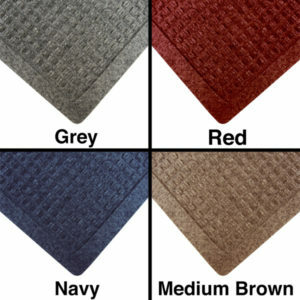 Spectra Soaker Polypropylene Carpet Mats are available in the following colors: grey, red, navy, and medium brown. * If you prefer a different color or size, give us a call to learn about other unlisted colors and sizes that we can order for you. To order either of these rugs, call us at 800-442-6622 M-F 7:30AM to 5:00PM (EST). We can also order other rugs by Musson, including custom logo mats, commercial area rugs, runner rugs, and other outdoor and indoor entry mats. Speak with an Equiparts Product Expert today for more information. Click to view, share, and/or save the Spectra Mats PDF.